casting, chasing, engraving, carving, enamels. Belonged to the Grand set of Russian Tsars. Gold, precious stones, wood, fabric; flat chasing, embossing. Son of Boyar Fyodor Godunov. Brother-in-law (brother of the wife) of Tsar Theodore Ioannovich, who had no children. 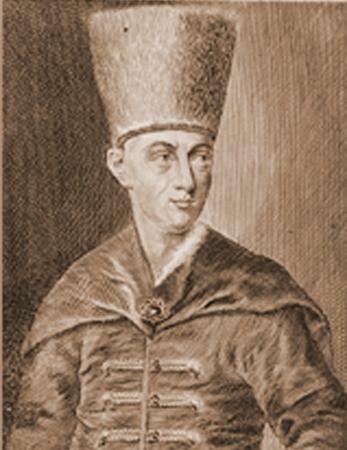 After Theodore had died, Boris managed to take the power cutting the legal heir to the throne (the younger son of Tsar Ivan the Terrible Dmitri Ivanovich, who died in the city of Uglich). While the 1598 crowning ceremony of Boris Godunov an orb was included to the set of regalia which were to be given to the Tsar. Orb. Western Europe, circa 1600. Was incorporated into the "Grand Attire" of the Russian sovereign. Sceptre. Western Europe, circa 1600. Was incorporated into the "Grand Attire" of the Russian sovereign. Huge golden orb is crowned with a cross. In the higher zone it is girt with girdles separating it into four sections with chased compositions of the Old Testament King David's life scenes: "Chrosmation of King David by Prophet Samuel", "David's mastering Goliath", "Coming home with the victory", "Persecution from Saul". Bright enamels on relief images, shining gems – green emeralds, red rubies, blue sapphires, begirt by enamel ornamentations - blend beautiful colours in a luminous stream. The golden scepter is graceful and proportional, with rich and dainty ornamental motifs. The heads of cherubs, flowers and clusters of fruits suspended on ribbons – everything belongs to a unique, rhythmically sized composition. Scepter and orb are magnificent creations of West-European Jewelry of Late Renaissance. By the way, the enamels on relief technique was not known to Russian goldsmiths of that time. There are reasons to consider the scepter and orb to belong to the set of gifts, brought to Tsar Boris Godunov in 1604 by the Great Embassy of Rudolf II, Emperor of the Great Roman Empire. 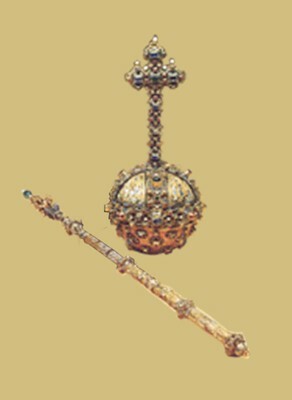 The scepter and orb, miraculously survived through the Hard Time, must have been used in 1613 in crowning of Michael Fyodorovich, first Tsar of the Romanov Dynasty. For later on during the whole reigning of Michael Fyodorovich they were unique regalia of the kind and belonged to the so called Grand set complex of especially valuable regalia. Belonged to Tsar Boris Godunov. The throne of Oriental work. 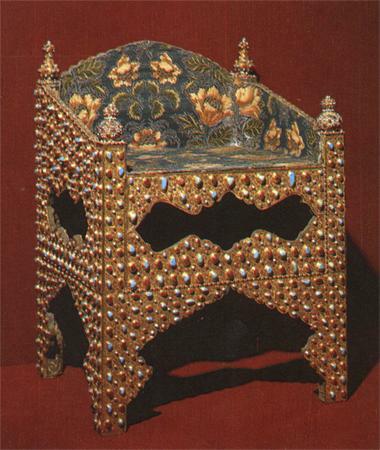 It was presented to Boris Godunov by Persian Prince Abbas I in 1604. The throne has a typically Eastern shape with a low back and elbow-rests. The throne is adorned in Oriental manner with gold and basma stamping, blue turquoise and red turmalins. The back of seat, elbow-rests and all the underneath are upholstered in golden Persian velvet. In 1742, while preparing for Coronation, the old velvet was replaced by the new, French one.